Wait 'Til You Hear This News!! We got one of the best Christmas presents ever! Our daughter, Rebecca, is going to have another little baby! She's 8 weeks along and due the 6th of August. That makes 2 new Grandbabies next year. I told my girls and Wes III, when we found out Melody was pregnant, "I feel like by the end of next year, we will have 3 new babies." No, nothing more to announce.... yet!! I still think there could be 3 but it's not up to me. 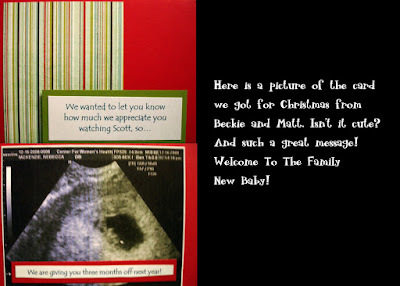 Little Scotty will have a new brother or sister! It's going to be an exciting 2009!